I have just finished ‘The Paris Wife’ by Paula McLain. It is a novel that parallels the real lives of Ernest Hemingway and his first wife, Hadley, as told through Hadley’s perspective. This is done so well that I often forgot I was reading a work of fiction. Having first read, ‘A Moveable Feast’ by Ernest Hemingway, whose account of the same time period was part of McLain’s research material, I spent a few days letting his description of their lives sink in. I could feel the support and love she held for her husband through his own words that often portrayed her as being left out of the conversations between their famous friends – most notably Gertrude Stein. I could also sense the loneliness she must have felt as she watched him leave every day to sit in cafes in Paris or go to his separate writing room. Living on very little income, she had to find the least expensive ingredients for meals and stroke his ego when the loathsome darkness descended that often enveloped him and would eventually lead to his suicide. Unfortunately, he fed his voracious appetite for life and the always fleeting fullness, with the affections of Hadley’s friend Pauline. Wounded and betrayed, she tried to remain within the marriage. But three is not a number intended for marital bliss. Alas, they divorced. But Ernest never stopped regretting this and probably never had another wife who meant as much to his life and career as she did, although he tried three more times. Paula McLain obviously spent a bit of time getting into the inner heart of Hadley as well. Her words seem true, fit so well with my own image of her that I had to remind myself that it was a novel instead of a memoir. Hadley’s resonating truth leads the reader to also believe the words of other characters such as Scott and Zelda Fitzgerald, James Joyce, and Ezra Pound. It is such an interesting concept to take real people and insert them as they probably would have been into a novel. And a huge responsibility to remain aligned with as much reality as possible. McLain accomplishes this so effectively that it is like voyeurism. I fell in love with Ernest Hemingway in his own accounting of this time period, Paris in the 1920’s, as told through his aged and experienced eyes forty years later. His tenderness for Hadley, his realization of his own faults, his honesty about his actions pulled at my heart as no other work of his ever has. Paula McLain must have felt this as well, weaving sympathy for him into surprising places. How did she choose the words for her characters, most of whom were larger than life, while maintaining this sympathetic bent? I have an idea that her purpose was to illuminate Hadley’s response, who had sympathy for Ernest while dealing with her own traditional values of marriage. Yet the stomach churning unrest and cataclysmic emotional turmoil that results from betrayal was palpable on the pages of the book. If there was any portion of the book that seemed unreal, fabricated, it was the relationship between Hadley and Pauline after the love triangle had been exposed. Yet, given the rest of the dialog and on-point circumstances, I can only surmise that the author obtained this from research into those last days. And the time period between World War I and World War II was quite different than the current era. Women in America had just received the right to vote. Very few women worked outside of the home and the civil rights movement wouldn’t happen for another forty years. Divorce wasn’t common and usually reserved for cases of gross abuse. Fidelity within marriage may have been a luxury that few obtained. Hadley was invested in Ernest, emotionally, physically, mentally. She had begun to fear spinster-hood before he came into her life. Perhaps she feared life without him more than she did sharing him with another woman. I cannot fathom that McLain would stray from reality in the very last chapters of the book and trust that this was how it happened. Perhaps the actual words were different, but Pauline’s presence must have been there, the splitting stick wedged into a log of wood that aids the splintering when struck. And strike she did, disregarding loyalty to Hadley and luring Ernest into another marriage that wouldn’t survive. “I wished I had died before I ever loved anyone but her,” Ernest writes in ‘A Moveable Feast’. In ‘The Paris Wife’ McLain has Ernest saying to Hadley over the phone in their final conversation, “I ruined it,” as regarded their love and marriage, and “Take care of the cat,” meaning herself. We all know what happens next. 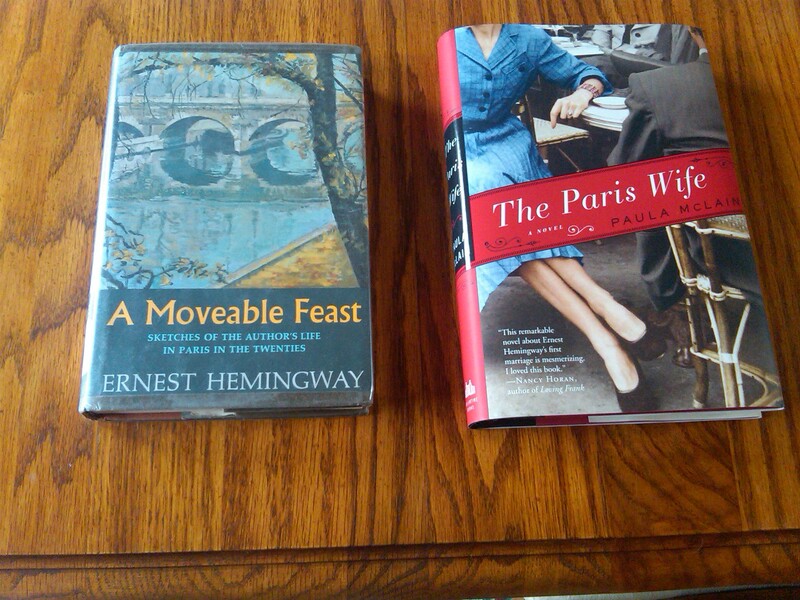 We know what happened to the first Hemingway marriage before we turned a single page in ‘The Paris Wife’. This often ruins a book. It is a testament to Paula McLain’s skill as a writer that this knowledge doesn’t hinder the reader at all. The description in the book jacket refers to ‘The Paris Wife’ as all the more poignant because we know about its heartbreaking ending. I recommend it, but as my teacher and friend Janet Hulstrand said to me, “Read ‘A Moveable Feast’ first, the original 1964 edition by Ernest Hemingway and published posthumously having been edited by his fourth wife, Mary. Then prepare yourself to fall in love with Ernest Hemingway the man, instead of the macho image we have long romanticized. Wonderful review. If my internet ever stays on long enough, I’ll be looking at available versions on Amazon shortly. What a wonderful post: I’m so glad you enjoyed reading The Paris Wife! And, as usual, I find your insights and thoughts about it interesting and wonderfully well expressed. Seeing the cover of the version of A Moveable Feast that you bought and read has made me aware that there is a bit of a problem in describing which version of the book I am recommending to readers. I said, in the closing words to my blog post, that I recommend “the 1964 version.” I now realize that it would have been more accurate (and helpful to readers) to recommend reading “the ‘unrestored’ version” (and in fact I have changed the wording on my post accordingly). What’s important for readers to know is that if they want to read the version edited by Mary Hemingway and originally published in 1964, they need to buy any version OTHER than the one published by Scribner’s as the “restored” work in 2009. The edition you found and read is fine, of course. My only concern in clarifying the confusion is that it is probably much easier to find, and less expensive to buy, the 1996 paperback edition of the 1964 work. When I saw the book cover of the one you show on your blog, I realized I should make this known to your readers. Though this whole thing is making me feel like far more of a pedant than I am used to feeling 😦 . I got the one in the photograph from the local public library, which actually had an original copy. (I was too impatient to wait for it to arrive in the mail!) It felt like a treat to hold the book that was nearly as old as I am and still be enthralled by the words between its cover. Such is the power of a great writer and I took more from it than Hemingway’s early 1920’s perception of Paris. Several of my friends are purchasing both books and I don’t think they have had a problem with obtaining a copy of the 1964 edition, even if reprinted in current years. But your clarity on this is right-on and I appreciate the thoroughness with which you present your thoughts. I don’t think of it as pedantic, just your desire to make reading great material easily accessible to everyone. Thanks to your excellent recommendation, I ordered and read both books and thoroughly enjoyed them! Upon re-reading your review above, I would have to agree 100% on your description. I was surprised at how moved I was by both books. I’m so happy to hear this and glad that you enjoyed the books! Just wandering around a bit. Enjoyed your take on these 2 books. Haven’t read “The Paris Wife” but now intrigued.